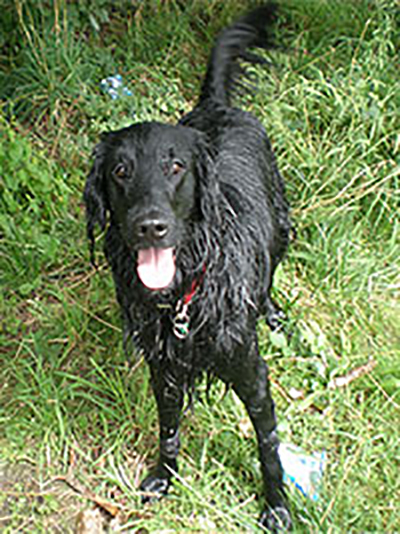 The flat coated Retriever is often referred to as the “Peter Pan” of the retrieving breeds. Quite simply because they love life and live it to the full. They crave the company of humans and are not good left to their own devises. They are slower to mature than their Labrador or Golden cousins and therefore can be well into their “middle years” before they grow up. They are known for their lovely temperaments and affectionate nature. All they want to do is to please their owners. Whether their ideas of pleasing are in line with that of their owners is often a debateable matter. They are full of energy and therefore need firm but sympathetic training. My role within the Flat coated Retriever Society is that of “Litter Secretary”. Simply put this means that anyone who has bred a little of puppies and requires assistance in placing them in homes can put them on the Society Register. Providing of course they comply with our Code of Ethics in terms of health tests etc. People who are looking to purchase a Flat coat puppy then contact me and I will put them in touch with breeders whom I feel are best suited to their requirements.